The act of removing an old, decaying floor was once a messy endeavor. Your home, or at the very least the room in question, would need to be closed off for renovations. It was a hassle. Here at American Flooring Removal, we remove that hassle. Our dust-free tile removal services in North Richland Hills offers endless possibilities for your home flooring! When you have your mind set on renovating or replacing your floors in North Richland Hills, look to our licensed flooring experts at American Flooring Removal. We know that quality flooring will make all the difference in your home. Furthermore, exceptional flooring can increase the property value of your home. Dust, however, does not. At American Flooring Removal, we use dust-free methods to remove old flooring and install new materials. It is convenient, cost-effective, and the perfect investment for any type of home – new or old. Now is the time to schedule floor removal in North Richland Hills! Our dust-free tile removal services in North Richland Hills were designed with our customers in mind. Whether you require residential or commercial flooring removal, our licensed experts can tackle the job with professionalism and quality. Our methods leave your flooring clean and fresh for the next step! North Richland Hills is a mid-to-high end suburb in Dallas and Fort Worth. As the third largest city in Tarrant County, North Richland Hills is home to suburban neighborhoods, exquisite shopping centers, and local, highly-rated eateries to enjoy. We’re proud to serve the good folks of North Richland Hills! 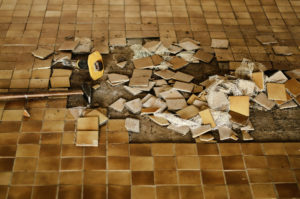 Call American Flooring Removal for dust-free tile removal in North Richland Hills. You can reach us at 469-556-3936! We serve entire North Richland Hills, TX 76053, 76117, 76148, 76180, 76182. We are neck deep in a renovation and it was a true JOY to have American Flooring Removal come out to help wrap up some demo work (grinding down mastic and smoothing out surface for new tile along with a last minute decision to tear up bathroom tile). Cannot tell you enough that we 100% recommend this company. The guys (Steve and Josh) were incredible! Dust free, friendly, reasonably priced and fast workers....wow, just cant give enough "stars" amazing job!! Would and will hire again in a heartbeat! Hope they start laying flooring too! !